THE National Longitudinal Study indicates that the impact of Affirmative Action laws and diversity-enhancing public policy is far different from that imagined by most Americans. 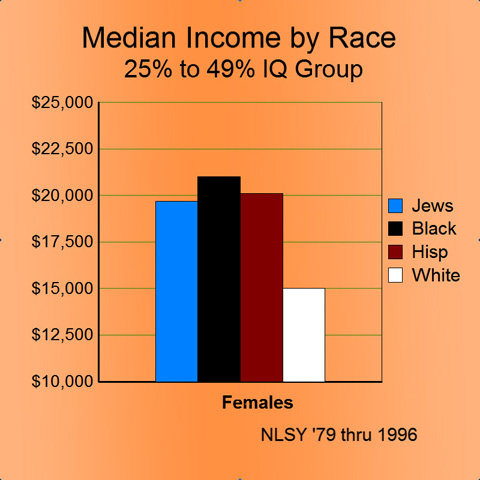 Instead of being over-represented (which equality advocates often view as something in need of “correction”), European-Americans of both sexes and all IQ groups are increasingly under-represented in the economy and are discriminated against in terms of income and higher education. Jewish-Americans are dramatically over-represented. Most white Americans believe that the vast array of race preferences only affect those whites in lower socioeconomic levels — those in the bottom 20% by IQ and income. Most Whites at the highest socioeconomic levels believe that only the proverbial six or seven Whites denied admission to the University of Michigan Law School because of their race — or others whose stories make it into the media — are adversely affected. We are going to test those typical thoughts and attitudes against data maintained by the United States Department of Labor, which maintains an elaborate census based on statistical sampling called the National Longitudinal Survey of Youth 1979 (NLSY ’79). Over 155,000 youths were surveyed by telephone and 12,686 were finally selected as representative samples to be given an IQ test and then interviewed annually or bi-annually for the rest of their lives to track their progress. Comparing outcomes for the entire population is misleading because of significant differences in average age (income increases with age) and significant differences in average IQ or ability. 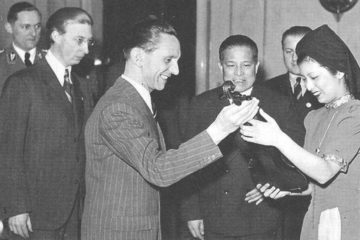 Only by comparing racial groups at the same age and ability level can you determine whether race preferences created by the “Civil Rights” laws produce distributive justice, or whether they produce subordination and exploitation. 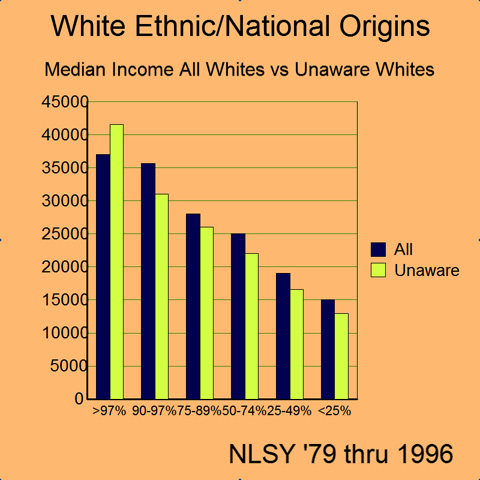 All of the NLSY’79 interviewees grew up after the racial preferences were put in place by the Civil Rights acts of 1964 and 1965, and after implementation of massive school redistricting, school bussing, and massive Federal expenditure on Operation Head Start designed to eliminate racially unequal educational outcomes. 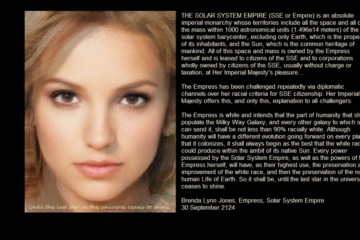 Thus, we have the ability to test the relative education and incomes of the races at the same age and IQ level after massive Federal intervention and remediation for the supposed purpose of reducing the inequality of the races. So let us compare our attitudes and assumptions with the data. 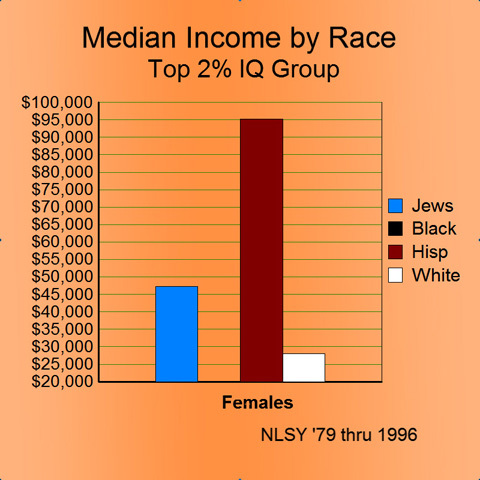 Above we see the income results for the top 2% of the population by IQ for males. 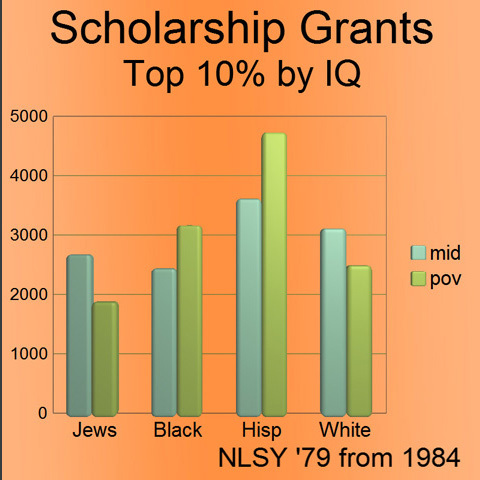 The top 2% includes all those who have an IQ of 130 or above. As you can see, white males do significantly worse than their competitors. 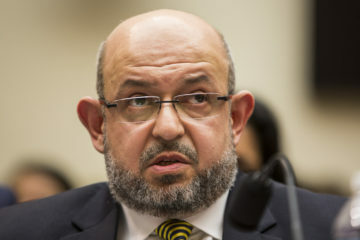 Jews are the only ethnic group which has benefited from or escaped the consequences of the racial preference schemes enacted by our Federal Government. 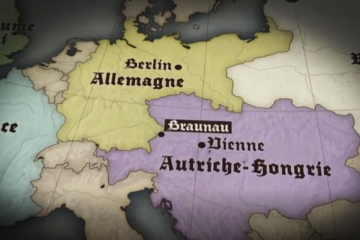 All other white ethnic origins are grouped together in a very narrow range with outcomes very similar to the overall white average. So where are the undeserved privileges we hear so much about ?? 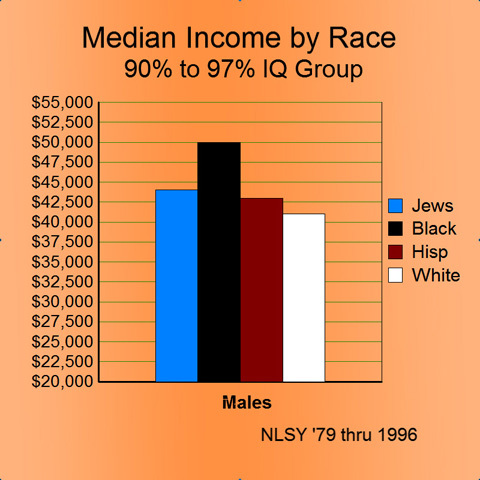 Above we see the same pattern (in incomes for the 90-97% IQ range) but with somewhat less dramatic differences between races. Once again, whites are at the bottom. Above we see very dramatic differences in median income for the remainder of the top quarter of the population by IQ. Where are the undeserved privileges we hear so much about? Below the top 25%, the pattern for males shifts, with white males doing better than blacks but not as well as Hispanics or Jews. Contrary to popular opinion, race preferences have the greatest impact on white males in the top quarter of the population IQ range — at the highest socioeconomic levels. Here we see the same pattern, with Hispanic males (the largest minority group) doing significantly better than white males, but with black males doing marginally worse. We are beginning to see “small sample” effects here as there are only a few Jews in the sample (and relatively few in the Jewish population at large) below the population median IQ. Same pattern for the bottom quartile of the population by IQ. 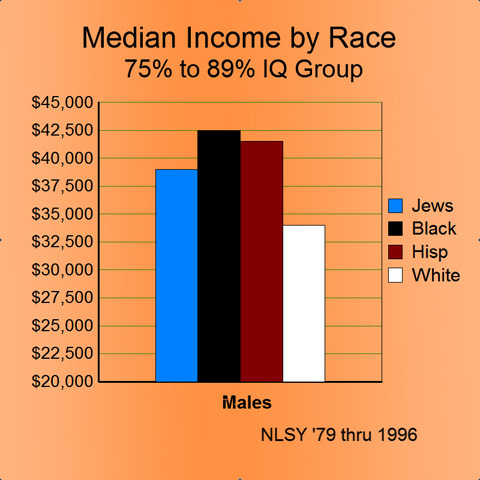 But note that Hispanic males earn substantially more income at every IQ level than do white males of the same IQ. 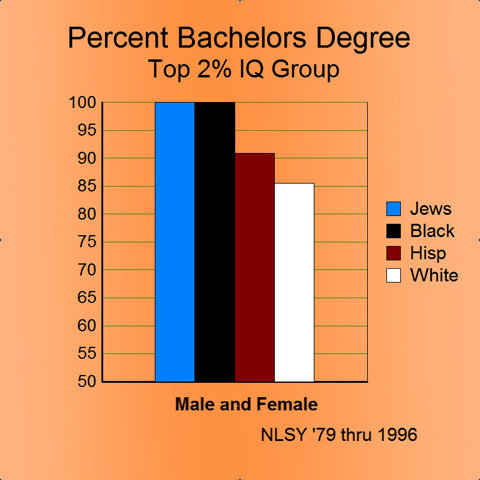 Here we see a familiar pattern for females in the top 2% by IQ. 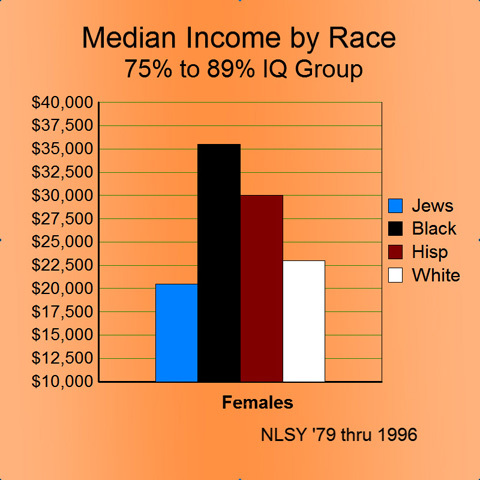 The income differences between racial groups for females are much larger than for males, with white women at the top of the IQ spectrum earning only 30% of what Hispanic females earn at the same IQ level. In a very large sample of over 3000 blacks, there were no black females who scored in the top 2% of the population. 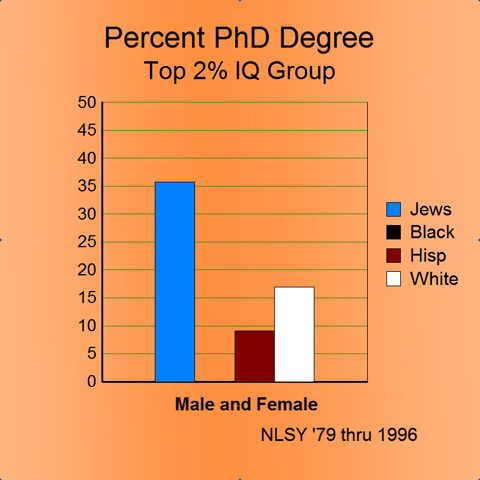 Here we see the same dramatic occupational and pay discrimination against white females in the top 10% of the IQ spectrum. Is the statutory inclusion of “women” as a protected class under “civil rights” laws just eyewash and a diversion intended to focus white female anger at white males rather than upon real threats to their economic well being? 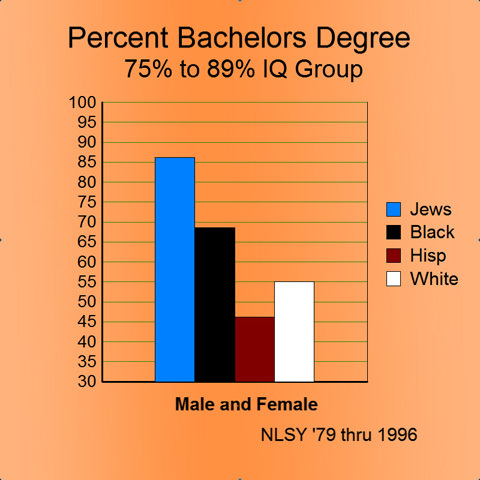 We get the same pattern for the remainder of the top quarter, but with a “small sample” effect for the Jewish females in that IQ group. Here, the experience for white females begins to deviate dramatically from those of white males, as white females in the lower IQ groups earn significantly less than their racial competitors at the same IQ levels. 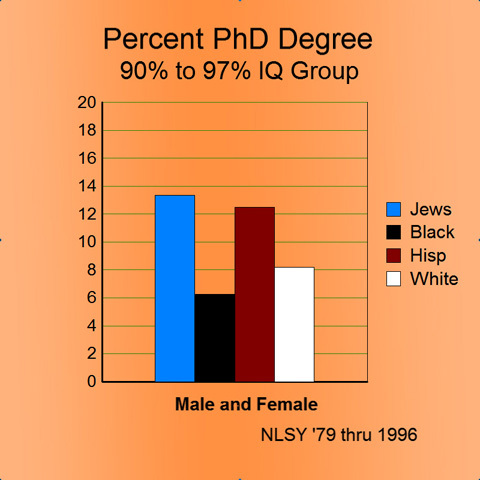 While white men in this IQ category do reasonably well compared with their racial counterparts at the same IQ level, white females do dramatically worse. Ironically, opinion polls show that white females generally support the race preference schemes called “Affirmative Action,” perhaps because white females are entirely unaware of these data. 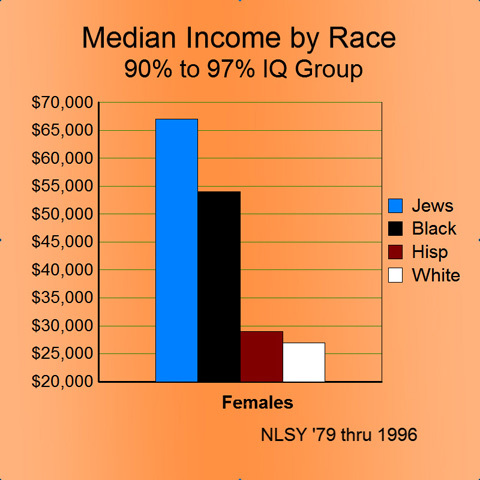 Again, the same pattern (but with only one Jewish woman in the sample with an IQ in the bottom 24% of the population). If we were to deduce the purpose of the race preference system in the United States based on outcomes — as opposed to wishful thinking and proclaimed intentions — it would be to exploit white females from top to bottom. 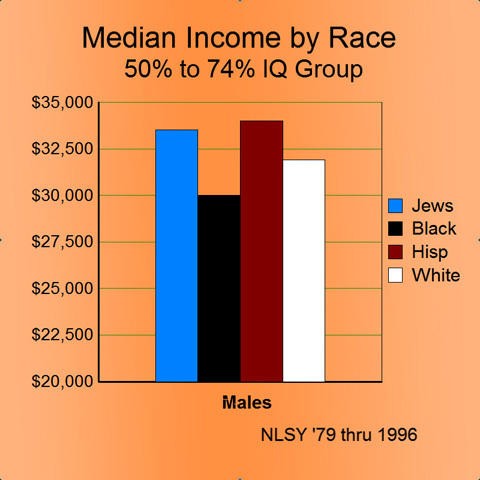 A secondary purpose of the race preference system in the United States would be to disadvantage and displace white males at the top of the ability and IQ spectrum. 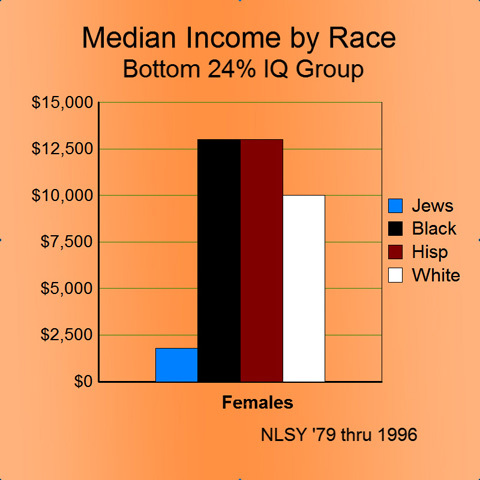 Those of you who are awake and alert may have noticed in the above series of income slides that median income for white women is less than for white men at the same age and IQ level. 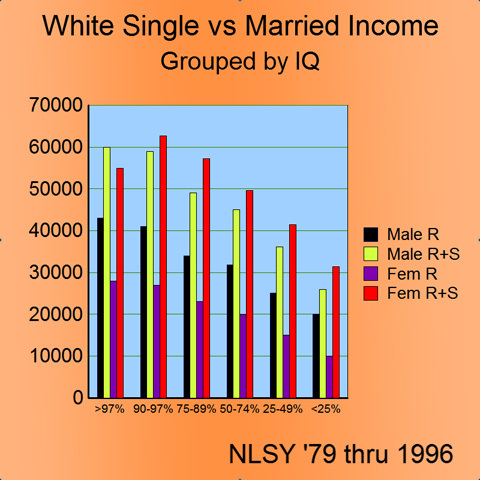 However, most of the white females in the NLSY ’79 sample marry, and as you will note from this chart, when the husband and wife’s incomes are added together (R+S), white females do better than white males at all IQ levels except the top 2%. A comparison of the black with violet bars gives you a comparison of male and female only income, while a comparison of the yellow bars with the red bars gives you a comparison of male and female family income. This chart shows that a prudent marriage is just as important in the 21st century as it was back in 1815 when Jane Austen wrote her famous novels such as Pride and Prejudice. “R” stands for “respondent” or survey participant, while R+S stands for respondent and spouse. The median income for R+S includes those who never married and those now divorced, thus lowering the difference between single and family incomes in the slide. 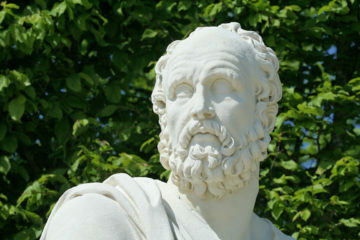 A complex society needs high IQ people to administer its activities and to solve its problems. Thus, everyone in the top 2% IQ group should go college and receive at least a four-year degree, and the overwhelming majority should receive graduate and professional degrees. 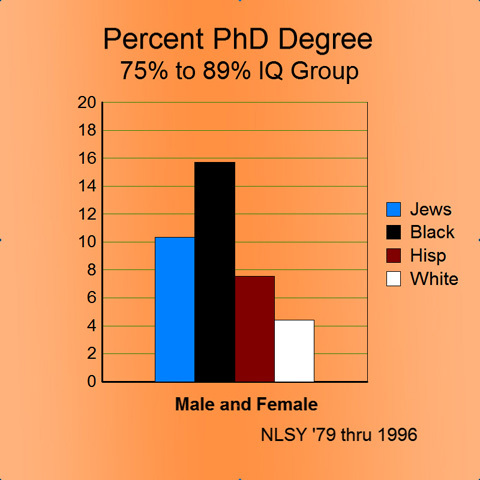 As you can see, in contrast to their racial competitors, nearly 15% of whites in this top IQ group fail to get a four-year degree. 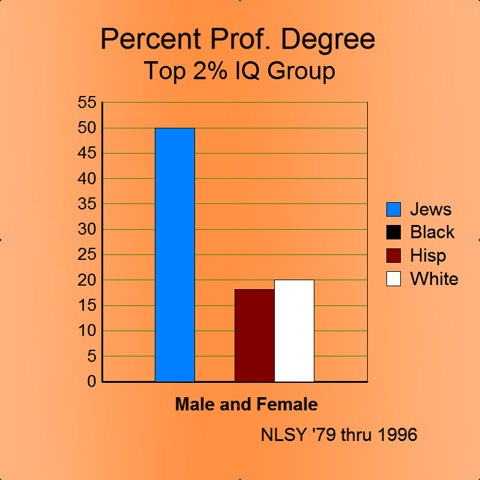 Again, whites in this top IQ group do worse than those in competing racial groups. So much for white over-representation on campuses. 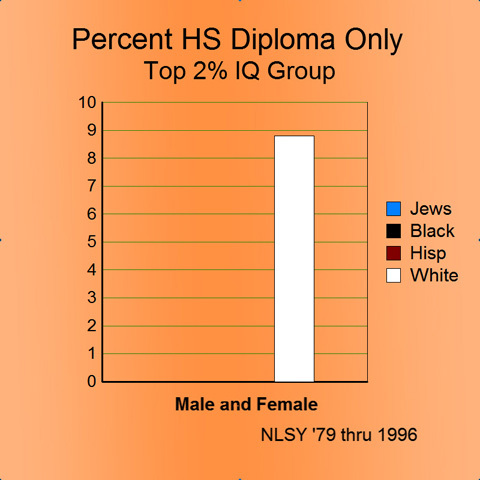 Drilling down into the nearly 15% of whites in the top 2% IQ group who do not get four-year degrees, we see that nearly 9% of whites at that IQ get a high school diploma only, with no college. 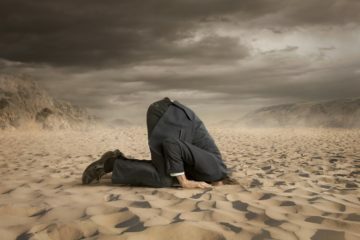 A bright mind is indeed a terrible thing to waste, and the study indicates it is the bright white gentile minds that are being denied educational opportunities, at significant costs to our country. This chart, and the preceding one, suggest that there would be no need for the H-1b visas for foreign engineers, programmers, and doctors if the abilities of so many talented, high IQ whites were not being overlooked or excluded from appropriate educational opportunities. Indeed, it is only the existence of the H-1b visas that limits the horrific costs of this waste of high IQ talent and permits its continuance. H-1b visas are necessary to the scheme which you so clearly see in these charts to displace and subordinate high IQ white males. With the exception of the above chart, all charts in this section on four-year degrees include all those who go on and receive graduate and professional degrees. 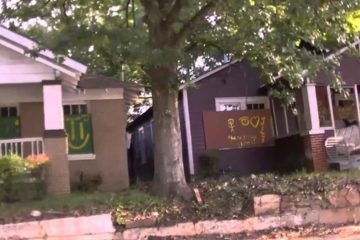 Here we begin to see evidence of genuine undeserved privilege in terms of admissions and grading that lead to four-year degrees for those in the 75th to 89th percentile IQ group. Notice how much better Jews do than those groups entitled to explicit racial preference. Still more evidence of genuine undeserved privilege is seen here, despite it being the opposite of “conventional wisdom” on the subject. In this chart we see compelling evidence of actual undeserved privilege as opposed to the propaganda version that is so widely preached in our Universities. We also see compelling evidence of a “back door” to college admission which must be operating for those who, while not entitled to explicit preferences, nevertheless seem to do much better at these lower IQs than the racial groups that are entitled to explicit preferences. There is, at best, only marginal utility for society in having people from this IQ group receive a college education. 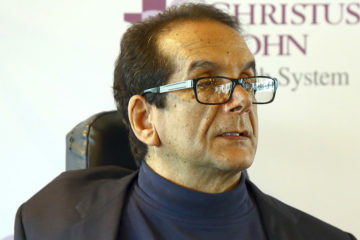 However, there may be significant individual benefit if a degree is required for a job in government or the non-profit sector of the economy — but only if the individuals know in advance that they will have connections in those bureaucracies willing to prefer them for such jobs. No surprises in this top IQ group. The chart merely continues a pattern seen in the charts for undergraduate degrees. Again, no surprises in this IQ group that rounds out the top 10%. As expected, the greatest preferences are going to show up in the IQ group which can only provide marginal candidates for PhD degrees. 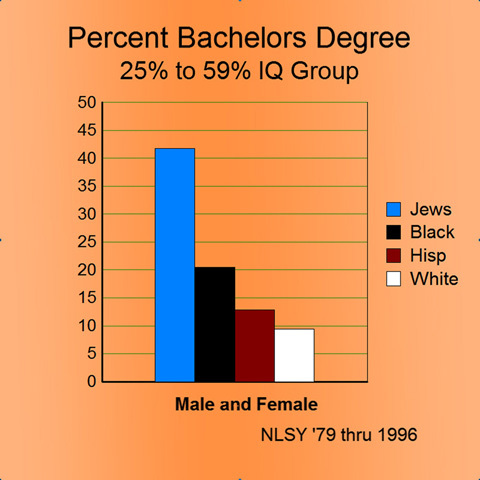 The surprise is the percentage of Jews in what, for them, is a lower IQ group — more than double the percentage of white gentiles. We switch now to professional degrees — doctors, lawyers, dentists, etc. 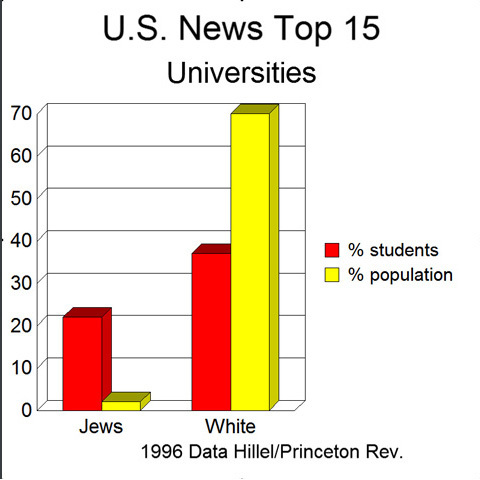 — and, as you can see, Jews receive more than double the percentage of professional degrees awarded to Hispanics and whites. 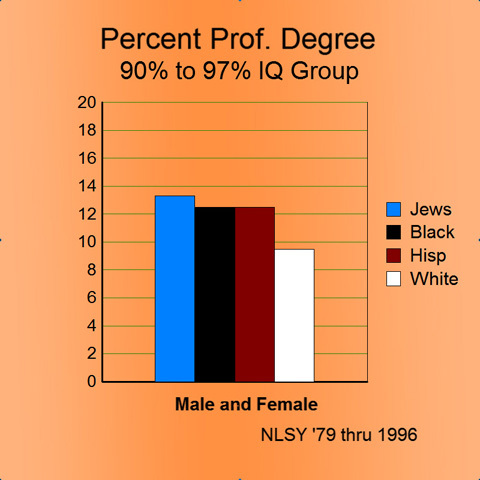 In the remainder of the top 10% of our population by IQ a lower percentage of whites attain professional degrees than do Hispanics, blacks and Jews — a clear consequence of race preferences — explicit preferences in the case of Blacks and Hispanics and possibly preferences by administrators exercising their administrative discretion in the case of Jews, who do not fall under explicit preferential laws or policies. 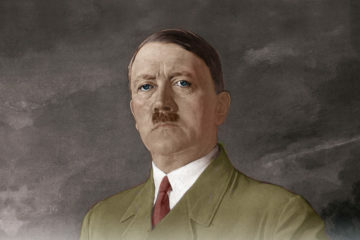 It is in the remainder of the top quartile below the top ten percent mark that we see dramatic evidence of discrimination in favor of the constituent groups within the “Affirmative Action” coalition and against white gentiles. 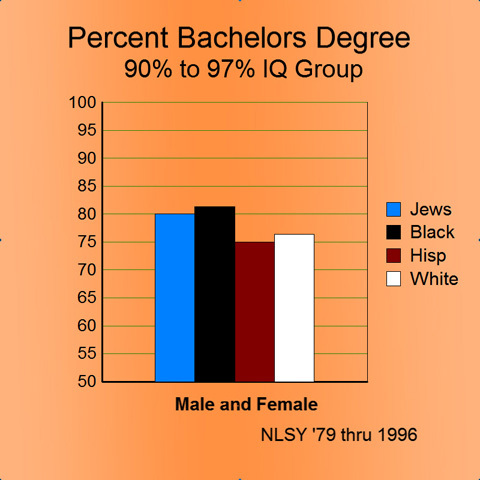 And once again, the big surprise is that Jews in this IQ range attain three times the percentage of professional degrees as white gentiles in the same IQ range. In the previous slides in this section on education no distinction has been made as to the quality of the degrees or credentials received. We shift gears now and examine an “Ivy League” school, Harvard University. As you can see, the chart excludes a very large group of Asians, Arabs, North Africans, and North American Indians. The table sets forth data from reliable sources published prior the first Internet exposure of this under-representation. Since that time, Harvard’s racial and ethnic reports have fallen victim to a variant of the Heisenberg principle, namely that reports of politically sensitive demographic data seem to change rapidly once the data are observed. Harvard is now reporting much higher percentages of “whites” but steadfastly refuses to define precisely what that term means — and why their definition has changed recently. Does Harvard’s notion of who is “white” include students from India, Iran, Pakistan and Turkey, for example? 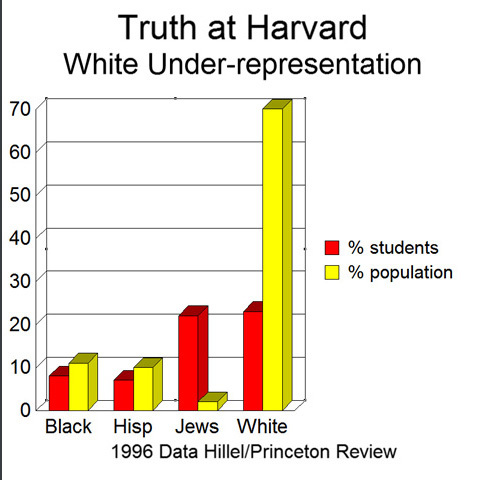 For purposes of this slide we took Harvard’s 1996 report of whites and subtracted Hillel’s report of Jews in attendance to determine the number of European-descended students. It is clear that Jewish birth rates are so low that the numbers of Jews admitted to Harvard must be in decline in the 21st Century. However, until Harvard stops hiding the ball, their new data can only be greeted with continuing suspicion. We see a similar pattern of under-representation in the top 15 universities as ranked by U.S. News and World Report using data from Hillel and Princeton Review. Finally we see that the NLSY ’79 made the mistake of asking about financial aid received in 1984. The results were so embarrassing that they never asked that survey question again. The chart shows scholarship grants or tuition reductions only, and does not include loans or work study (which really is no aid at all). The chart includes only those in the top 10% IQ group — where the case for financial aid is most compelling. As you can see, on average American colleges are lying when they say that they provide more aid to students in poverty than to those from middle and upper income families. It is only Hispanics and Blacks in poverty status who get more than middle class students of the same race. 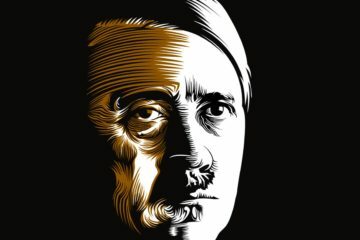 The discrepancy for Jews may be attributable to the level of support available from the very well funded Jewish charities. Regarding the above chart on financial aid, high IQ among the poor is overwhelmingly a white gentile phenomenon, and it is these students who get less financial aid than middle class white gentiles. It is a huge and highly destructive waste of talent. Percents on the Y axis are expressed as decimal fractions of the number one. 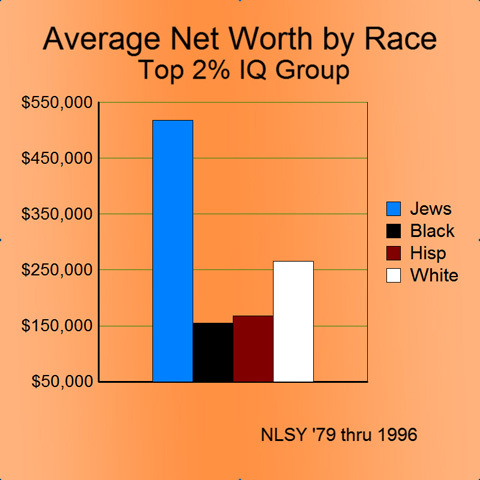 The slide above shows the average net worth of survey participants in each racial group in the top 2% by IQ. There is a data field in which survey participants report their net worth, and a data field for each type of asset — stocks, bonds, houses, rental real estate, business interests, etc., as well as a field for each type of debt — mortgages, credit cards, auto loans, margin, and business debts. An overwhelming number of participants seriously under-report their net worth, and so the slides in this section were prepared by summing the individual asset data fields and then summing and subtracting the debt data fields for each participant for each interview year, and then taking the highest year’s net worth for each individual. 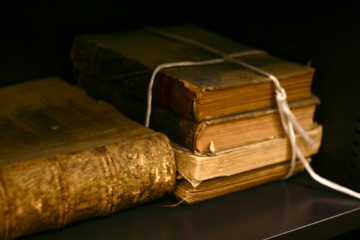 Note that the data ends with the 1996 interview year in which the oldest participants were 41 years old, before the effects of inheritance would become significant and before the stock market boom of the late nineties made it easy for those in the right place at the right time to become wealthy. Thus, the income and wealth charts reflect early career rewards for individual effort and “connections,” the latter possibly being very important among members of highly ethnocentric and wealthy groups. It is in the remainder of this top 10% that we see the real potential power of the previously-mentioned “connections” — and also a source of significant political power, and power to influence admission to private universities. Members of the wealthiest ethnic group are far more likely to become important, prosperous alumni and contribute generously to the university endowment. 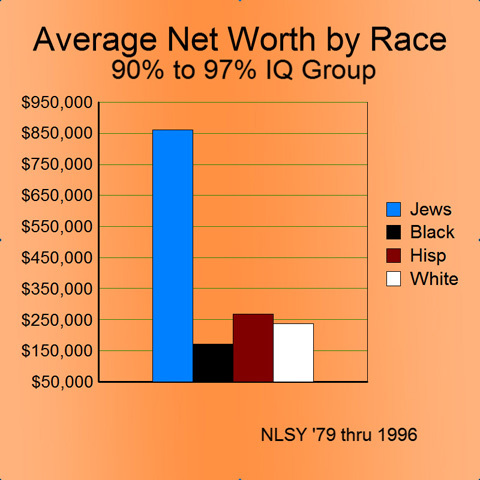 Note that Hispanics have a higher net worth than whites in this IQ category. 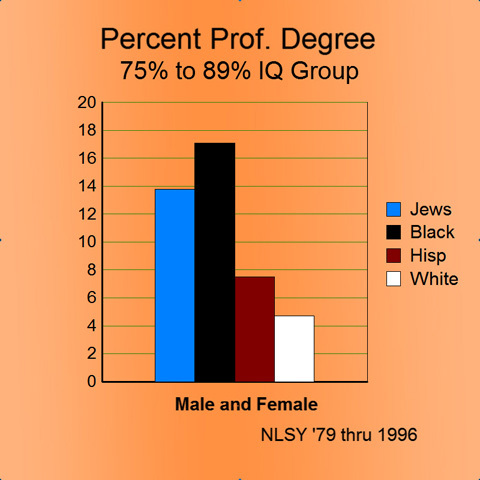 Outside of the top 10% by IQ, the difference between Jews and other racial groups — while still substantial — decreases. 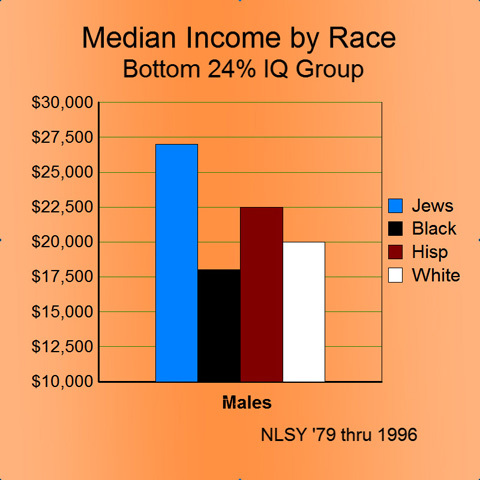 Note in particular the relatively low wealth accumulation by blacks at this IQ level, a level at which the most strenuous effects of preferences in their favor are seen in the charts above. Could this lack of savings be caused by a sense that saving is unnecessary because of the safety net that preferences provide? At this second quartile IQ level, wealth most probably consists mostly of housing rather than savings. But we may also be witnessing lower wealth levels as a measure of “present-orientation” rather than future orientation. 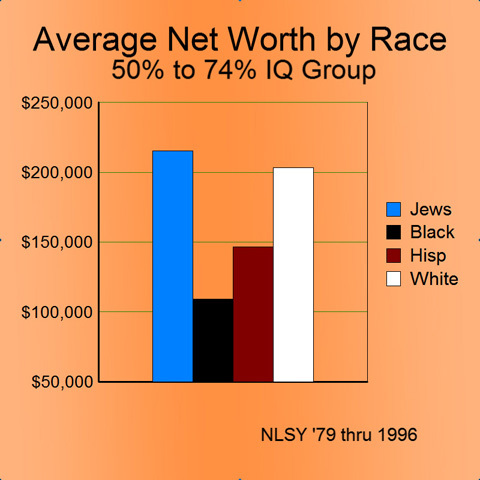 You will notice that the average net worth for whites is remarkably similar from the top down to the 50th percentile by IQ. 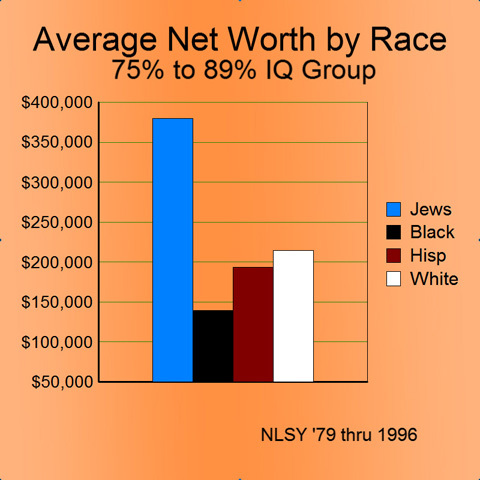 High IQ does not seem to confer the same wealth accumulation advantage to whites as it does to Jews. When contrasted with the advantage that high IQ confers upon white median income, this suggests that whites are motivated by visible status markers and only to a much lesser degree by the power of savings and wealth — which is largely invisible to their neighbors and co-workers. 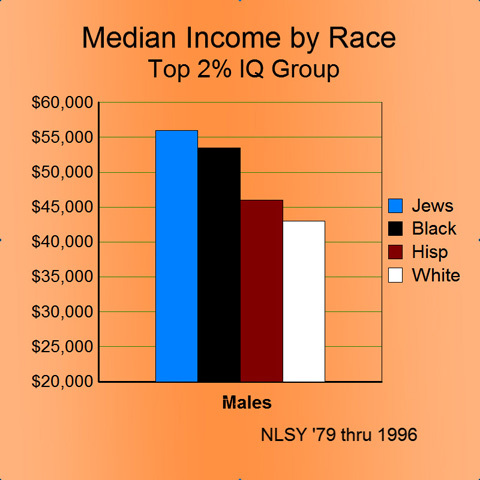 If you look carefully, you will notice that high IQ does confer a significant advantage in wealth accumulation on Hispanics. 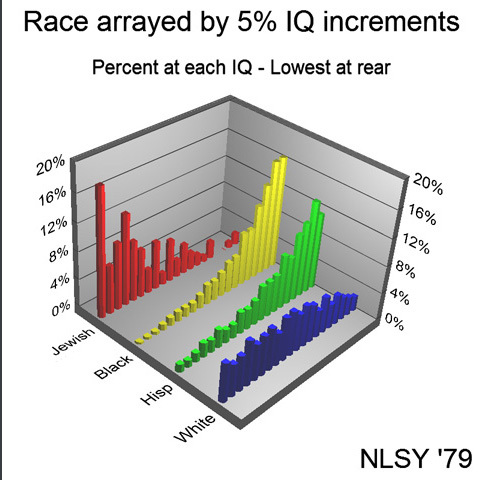 Above is a chart showing the distribution of the Jewish, Black, Hispanic and White survey populations arrayed by percentage of that population in each 5% IQ decrement beginning with the top 5% at the front left of the slide and the bottom 5% at the right rear. Looking at this chart, is is obvious that only one group within the racial preferences coalition has the capacity to strategize, finance, lead and administer that system. However, such a conclusion would not be obvious absent the preceding slides which show how well that group has prospered under the system they created. 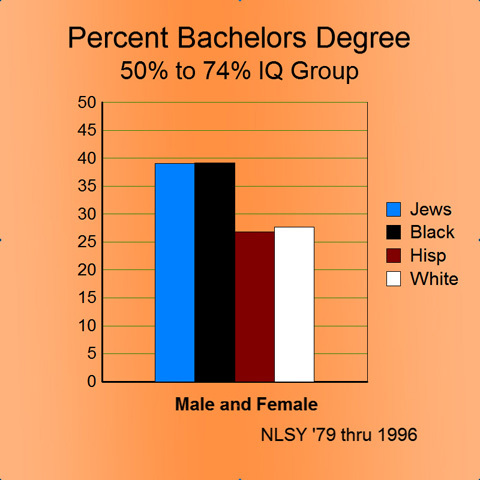 In addition you can see reasons that racial harmony and assimilation might be well-nigh impossible to achieve in the United States, as the black and Hispanic populations are overwhelmingly concentrated in the bottom half of the IQ spectrum. 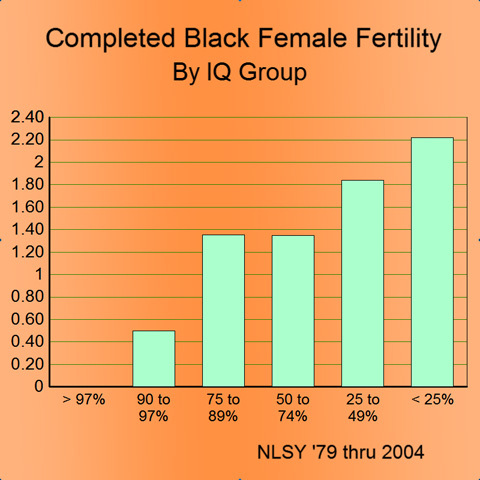 In this slide, the Y axis is the average number of children, and as you can see from the completed black fertility rates, blacks in the top half of the IQ spectrum are way below replacement averaging around 1.3 children per woman. 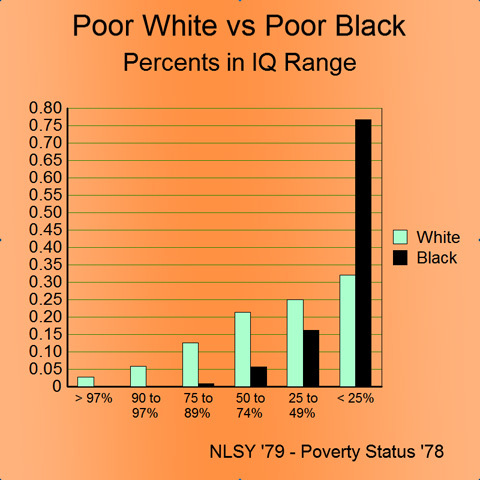 It is only in the bottom quartile, those with IQs below 85 that the black population is slightly above replacement. Thus, the black population in the U.S. is facing demographic catastrophe as differential birth rates by IQ render that population less and less competent with every generation. 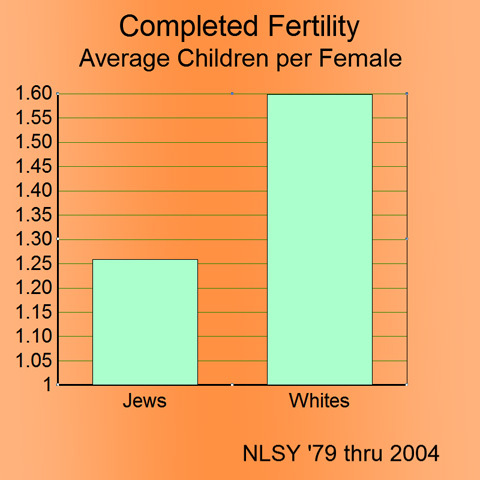 This fertility pattern guarantees ever escalating demands for more preferences and more wealth transfers from the white population. Racial harmony may be doomed. 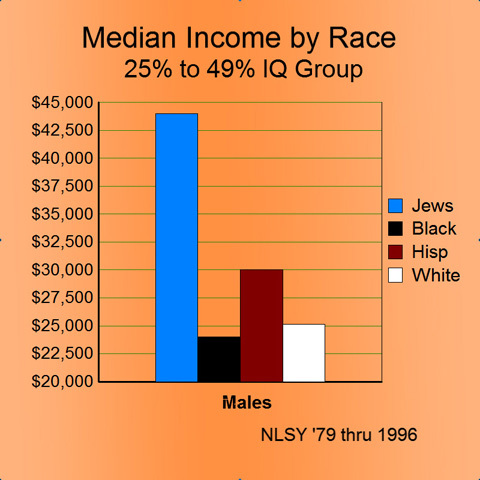 Above is a chart which shows that white gentiles who are unaware of their European ethnic origins have lower median incomes than do all whites in the IQ category. NLSY ’79 does not poll participants for their views on race, but this data suggests that caring enough about ones ethnic origins to be aware of them is a marker of high status relative to atomized individuals who do not care enough to know about their roots. The chart strongly suggests that racial awareness is a marker of high status — another indicator that current public policies of enforcing preferences and insisting on “racial harmony” are doomed. 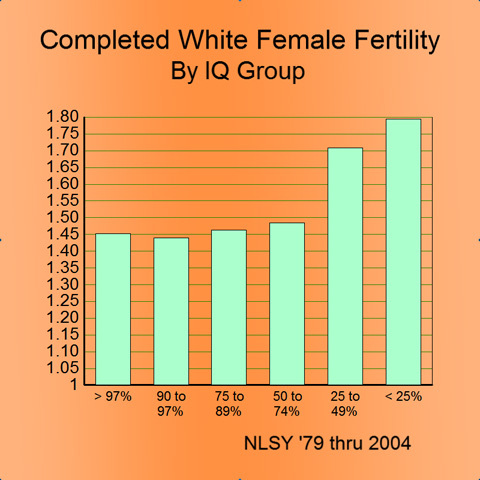 Here we see that white fertility in all IQ groups is below replacement and that birthrates of white women in the top half of the IQ spectrum are at catastrophic levels. 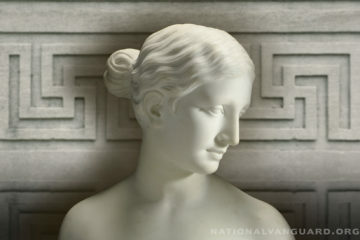 With far fewer high IQ whites available in future generations, the slide of the U.S., into Third World status will be rapid by historical standards, but slow and painful for the individuals involved. 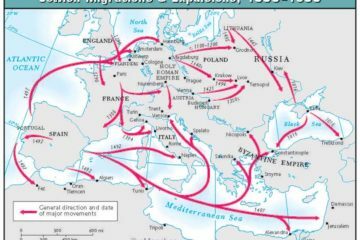 An increasing danger will be the prospect of high IQ white youth leaving the U.S. and emigrating to those countries in Europe with the highest birthrates at the upper end of the IQ spectrum, the lowest support costs for low-IQ minorities, and a governing elite that shares racial kinship (and hence empathy) with its native population. Even if one tried, it would be hard to design a more socially and politically unstable society than the one illustrated in the above slide and in this study generally. 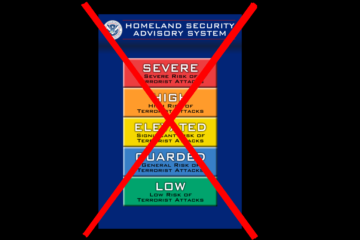 The elites who control the media and what Rasmussen calls the “political class” are well aware of the potential for volatility and conflict within this unfortunate racial and ethnic construct. 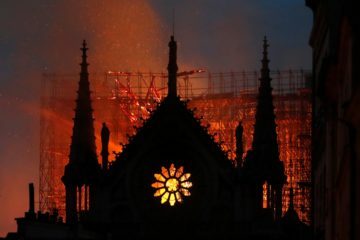 That is why the elite enforces its semi-cryptic system of censorship on racial matters so vigorously in the U.S., and desperately pounds into our heads the “moral imperative” of tolerance toward this volatile and ultimately doomed mix. 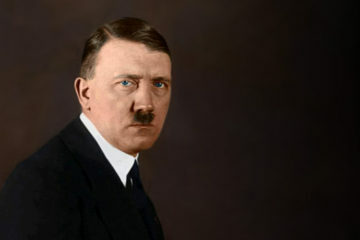 Thus far, the founding population of the United States has been willing to concede substantial economic and educational advantages to minorities in order to buy temporary peace, while remaining largely oblivious to the costs and the escalating burdens as they themselves fall into minority status. Is the nascent Tea Party movement partly a consequence of the rising discontent of this population group? 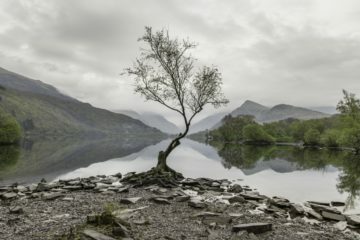 Is the gradual shift in attitude of minority populations from one of desiring assimilation (the “melting pot”) to one of demanding recognition of unique cultures (bilingualism, Afrocentrism, etc.) a sign of the ultimate breakup of America into its component peoples? Only time will tell. 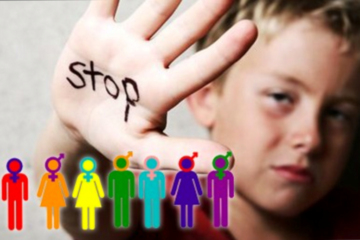 What Are They Doing to Our World?